"One Hit Wonder" appears in the June issue of Racer X Illustrated. Want to give our revolutionary new digital edition a try? You can read this feature in its entirety and the entire issue for FREE. Go subscribe after reading! With a camera slung over his shoulder, David St. Onge walked down an arena hallway looking for something to shoot—something worthy of a magazine cover. At least that was the goal. St. Onge had press credentials for round six of the 1997-’98 PJ1 Arenacross Series in Hampton, Virginia. He didn’t get a cover that weekend, however. Not even an inset photo. Instead, on his walk, he found something even more unexpected: one of his photographs already on the cover of a magazine. Although black-and-white and cropped, it was unmistakably a photo he’d captured nine months earlier, from the seats at the ’97 Pontiac Supercross, the very first stadium race he ever attended. Still 15 feet away from the vendor’s magazine rack, he froze and stared. The subject of the photo was 17-year-old Ricky Carmichael on a Kawasaki KX125. His motorcycle looked so flat, a layman might not be able to find it in the picture. The front wheel turned ever-so-slightly upward, the left end of the handlebar stabbed at the ground, and Carmichael’s arm stretched out so far he appeared to be losing his grip. He looked calm in the air; his head and torso twisted to the right, revealing the name and number on his jersey and a black goggle strap with Oakley’s recognizable elongated-O logo. In a loud, chaotic, dirty, and often brutal sport, this photo represented complete serenity. Behind Carmichael was nothing but crowd, yet their shades of gray more resembled paintbrush strokes than people. St. Onge approached the rack and pulled out Racer X Illustrated. The hair on his arms stood up; he felt his face get hot and his head spin trying to process the thoughts. His photo wasn’t really on the cover. Instead, the cover was a photo of his photo, which was . . . is that an Oakley advertisement? Is that a billboard? 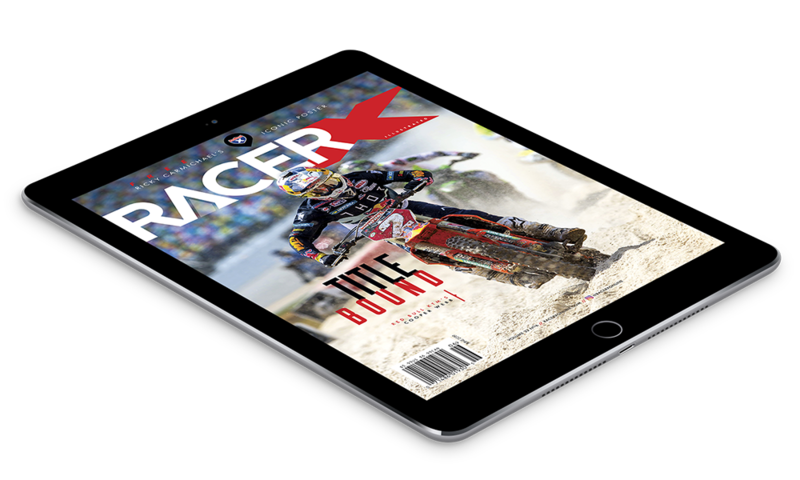 The Racer X Digital Edition has been completely rebuilt, allowing readers to scroll vertically from the beginning of the issue to the end on any digital device. Gone are apps, downloads, and third-party domains in favor of a single interactive document with dynamic motion and embedded video content. A “clickable” Table of Contents is accessible with one press for immediate, frictionless access to any part of the magazine. Test ride the issue and read "One Hit Wonder." Want to hear more about this story? Check out the latest episode of the Racer X Exhaust podcast, where Brett Smith joins Weigandt for a chat about the process of tracking down a story no one understood in full.